Jim Carrey's famous rubbery countenance appears more malleable than usual. The nations of Central and Eastern Europe have long been recognized in cinephile circles for their curious and idiosyncratic movie posters—ones far more daring and experimental than their cautious American counterparts, even when the films they’re ostensibly promoting are American in origin. A quick survey of Czech posters, Polish posters, and Hungarian posters reveals a whole world of startling, pseudo-psychedelic imagery designed not only to sell movie tickets but also to challenge viewers. There is even evidence to suggest that these works may have been subversive acts of political dissent during the era of communism. 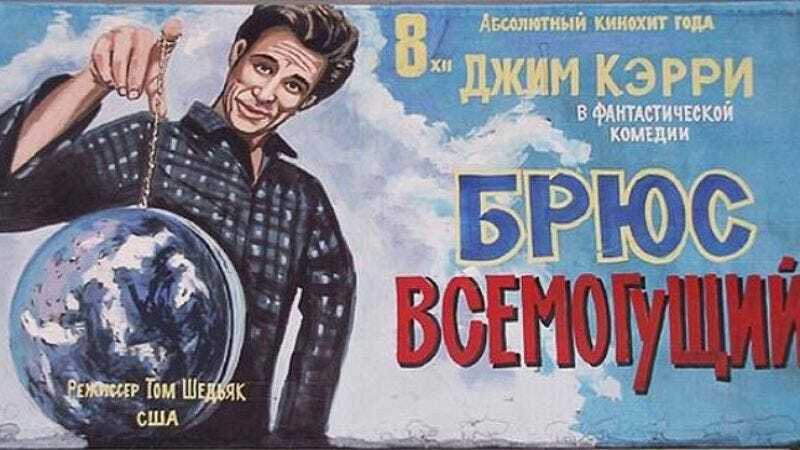 Meanwhile, the bleakly-named blog Sad And Useless (which bills itself as “The Most Depressive Humor Site on the Internet”) has collected a few recent and semi-recent examples of what it is has inaccurately termed “Awkward Movie Posters from Russia.” The images, nearly all of which were taken from this LiveJournal account, are actually from Belarus and the Ukraine. Unlike the above-mentioned foreign placards, which tend to be newly-created works of uncompromising art, the handmade images anthologized in this article tend toward earnest but hopelessly misshapen copies of familiar American advertisements. Apparently, there exists the strange notion that a portrait of a jaundiced, puckered Will Smith or a half-melted, purplish Renee Zellweger will attract rather than repulse customers. A foreign poster for 2004’s Anacondas: The Hunt for the Blood Orchid takes an entirely different approach, rendering one of the fearsome serpents of the title as a whimsical, Henson-like creation with large, soulful eyes and a clownish mouth. All the more reason to approach it with caution.